Gold for D.S.D., women in Raheny! 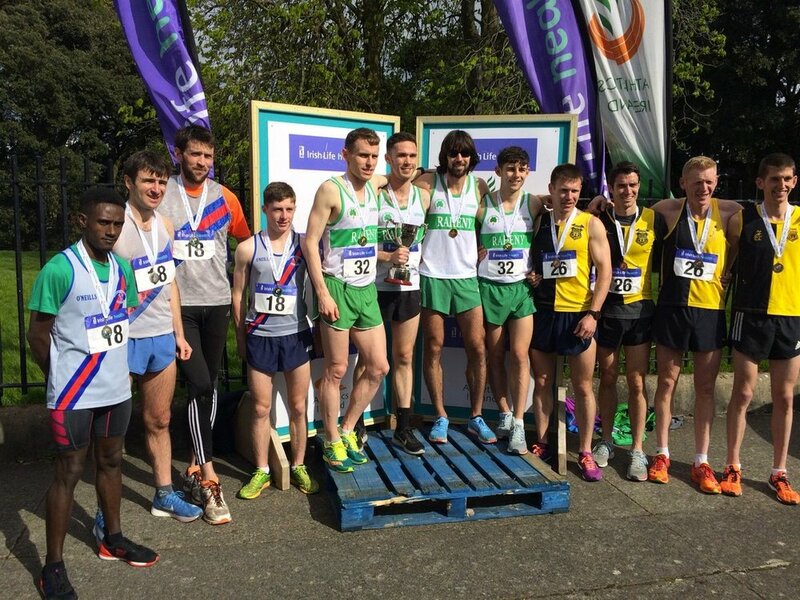 The end of a long hard winter of distance running ended on Sunday in sunny Raheny at the National Road Relays. D.S.D made a determined effort in both women’s and men’s races and ended up covered in glory as they took gold in the women’s race and silver in the men’s competition. All of the top clubs in the country were present for this finale to the season. Marathon Olympian, Linda Byrne, ran the first leg over 1 mile, in the women’s race and although below the distance she normally runs, she came in a close 2nd to North Down, with favorites, U.C.D., back in 3rd. Fiona Clinton took off strongly on the 2nd leg of 2 miles and retained her position, with U.C.D., slipping backwards. Meghan Ryan took over next and ran a scintillating last leg, as she caught the leader and produced a great sprint to the finish line to ensure D.S.D., of the gold medals, with North Down 2nd, Dublin City Harriers 3rd. The men’s race consisted of four athletes with defending champions, Raheny Shamrocks, going for three in a row, at their home venue. This turned out the most exciting race of the day, as Raheny, Kilkenny City Harriers and D.S.D., went head to head from the gun. Joe Sweeney was first up for D.S.D., returning from a long absence from competition after his great 4th place in the European C.C. Championships a few years ago. Joe showed he had not lost his competitive streak as he fought his way to the change over in 3rd place, of 25 teams. Just out of Junior (U20), Paul O’Donnell was next up and showed he will soon be a force at senior level, as he moved into 2nd place. Next came the real drama of the race as Hiko Tonoso took off 150m behind Mick Clohissey, Raheny, national cross country champion, and to the consternation of Raheny caught him close home to give D.S.D., a 4 second lead going into the last leg. Try as he might, John Eves, could not contain the in form Conor Dooney, as he brought Raheny home for three in a row, with D.S.D., 2nd and Kilkenny City Harriers 3rd. D.S.D’s second team finished 7th of the 25 finishing teams. This was a very young team of Patrick MacGabhann (21), Aaron Donnelly (18), Brian Maguire (17) and Mark Molloy (21), which makes the future of D.S.D., very secure in middle and long distance running.